Although it very much depends on what you’re making and what it’s to be used for, in many cases a finished embroidery needs to be stretched onto a board. If you wish to frame a completed picture or panel, for example, or are making a slip case for a book, the finished piece will need to be mounted correctly. 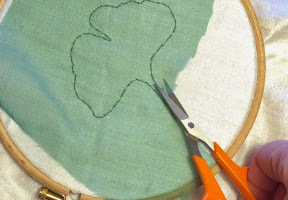 Even if you’ve worked your embroidery on a hoop or frame (and in most cases I hope you have! ), it will almost certainly have distorted slightly as you stitched, as the tension you will have used on each stitch will have varied slightly. Steam stretching will pull it gently back into shape. Place a towel on your ironing board or pad, and lay your embroidery face down on top of it. Put your iron on the steam setting, and hold it over the back of your embroidery, moving it slowly so that all of the fabric steamed equally. Do not press the iron down at this stage. 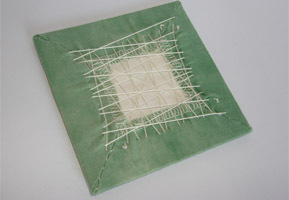 The fabric and stitching will have been softened by the steam; pick up the piece and pull it gently back into shape. Place it back down on the towel, face down again, and this time press it, to hold the shape. Allow the piece to cool fully before picking it up, or it may distort again. Once steam stretched, your embroidery is ready to mount on a board. This board needs to be solid enough not to bend when the fabric is pulled tight around it, so for larger pieces a thin hardboard may be used. For most smaller pictures, mount board, available in a range of colours from most art shops, will be suitable. Trim your work so that there is an equal width of fabric all round, allowing an overlap of about 1″ (2.5 cm). If you have an overlocker, use it to neaten and strengthen the edges, and prevent fraying. Place the fabric face down, and centre the cut board on it. 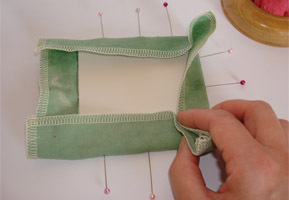 Fold the sides of the fabric over the board, and pin through the edges of the board, to hold it in place. Turn it right side up, and check that the embroidery is central and square. If it isn’t, remove the pins and adjust. It’s frequently necessary to do this several times. Once the fabric is correctly aligned and securely pinned to the board, the corners can be mitred. This both provides a nice neat finish and keeps the fabric in the correct position during the next stage. 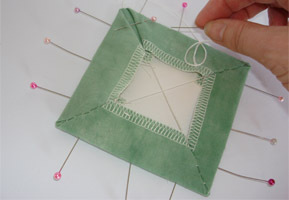 To do this, first thread a large needle with the strong thread and knot the end. Pass this through from the back of the fabric, close to the corner of the board. Fold the corner of the fabric over the board, so that it forms a diagonal; the folded fabric should be at 90° to each edge of the board. folded section; they should meet together neatly, with a small gap at the top. Pin in position. 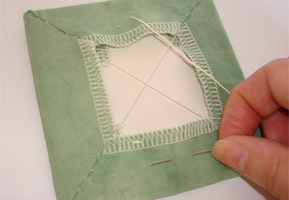 With the strong thread, ladder stitch the two edges together. Without cutting the thread, take it across to the opposite corner, and pass through to the front of the fabric as before. 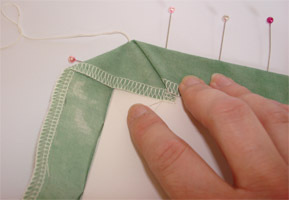 Fold, pin and stitch the corner as previously, then finish off the thread neatly. The second pair of corners should be mitred in the same way, then the pins along the edges can be removed. The lacing should be tight enough to keep the fabric taut, but not so tight that it bends the board, tears the fabric or distorts the embroidery. Take the thread back to the top edge, and repeat, until you reach the edge of the fabric. 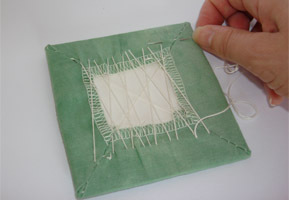 Take quite small stitches, and ensure that each one along each edge almost touches, to spread the tension evenly. Don’t worry about pulling the lacing tight until all the stitches are in place; once they are, pull each length of thread in turn to tighten it up – think Scarlett O’Hara’s corset! Once the laces are tight, finish and trim the thread. 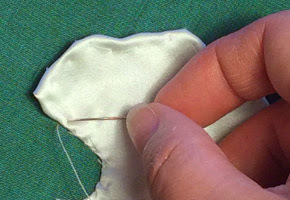 You should now have one half of one side of your embroidery laced – with a new length of thread, return to the centre and lace the second side. Once completed, lace the shorter side in the same way. 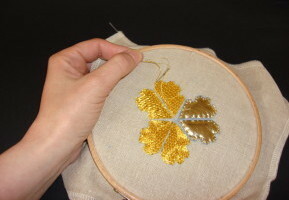 Always press embroidery from the back, as pressing the right side will flatten the stitching and can dull the thread. 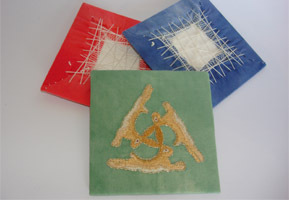 Goldwork threads and leathers in particular can be badly damaged by contact with a hot iron. 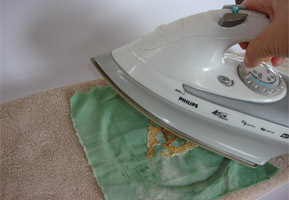 Placing a towel on your ironing board or pad means that the embroidery is not flattened by pressing, as the stitches are pushed into the soft towel rather than the harder ironing board. If you’re concerned with the longevity of your work, use conservation or museum quality mount board. This is acid-free and will not cause any damage to the fabric over time. For a slightly padded finish, cut a piece of felt to the size of the board, and attach it using a spray glue suitable for fabric, e.g. 505. 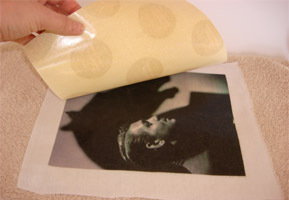 For larger pieces, wadding or carpet felt can be used. Pinning through the edges of the board means that you don’t run the risk of damaging a part of the fabric that will be seen in the finished piece. If you’re using hardboard, use drawing pins; for mount board, map pins can be used. Mark the dimensions of the board on the back of the fabric, to help line it up correctly and save time when pinning. Use tailor’s chalk for this, to avoid making marks that might be seen on the right side. When lacing the back, you should always start from the centre as this is less likely to pull the fabric out of true.